Putting a game on hiatus doesn’t normally seem like a positive development, but in the case of Scott Told Himself it was completely the right thing to do. After about 10 days of developing Scott we as a team had definitely hit burnout. Since we initially had focused on getting results over a general system we tried to avoid building a generalized system for content. However this forced a lot of the implementation work on our programmer. After our first sprint with the game we had only one out of four scenes to show and a whole lot of frustration. At this point we realized that the worst thing to do would be trying to push across the finish line. Instead we all agreed that Scott Told Himself was a game that we needed to return to at some point in the future. With a fresh mind and a renewed focus we knew we could muster up the energy to figure out what was plaguing our internal development process and finish the game. After stopping development the next best thing we did is return to finish Scott Told Himself. It was important for us finish Scott completely as a game since we felt strongly about a lot of the ideas present in the game. After over a month or so away from the game we returned in the midst of spring break for us. Since we had no additional pressures of finishing another game we knew this was the opportunity to completely focus on finishing the game. We stepped back, figured out a plan of development we could follow that roughly focused on completely a scene every day. While it took a little longer than that, within a 5 days of additional development we had all four scenes finally in the game with most of the gameplay implemented. Getting to the finish line for Scott Told Himself allowed us to release the game and see how exactly scripting meaningful moments vs. generalized systems would benefit expression and meaning (or perhaps hurt). And the player feedback to the completed game was very useful, we know could judge that scripting moments was a part of meaning and expression, but couldn’t completely co-opt the process. If we hadn’t finished Scott Told Himself and released it as a prototype, there would have been no way for us to judge that. When returning to Scott we realized that the biggest issue with the slow development of Scott was the lack of any clearly implemented scripting system. Instead we had a painful process where Felix as the designer would write out the general situations and Mike as the programmer would need to implement each line of dialogue, action, and reaction individually. This was an incredibly slow process and was why we had initially stopped development of the game. Upon returning to the game we knew that we had to build a more generalized system that allowed everyone to contribute toward implementing the scripted sequences. So our programmer Mike took it upon himself to create a basic structure where Felix could write down dialogue and basic actions and with a lot less effort those new bits of script would appear in the game. While implementation on the programming side was still necessary, it was much more straightforward than the previous process and allowed development to go much more smoothly than before. Scott Told Himself ended up being one of the longer games we developed and one of the main reasons for that was the amount of content we planned for the game. 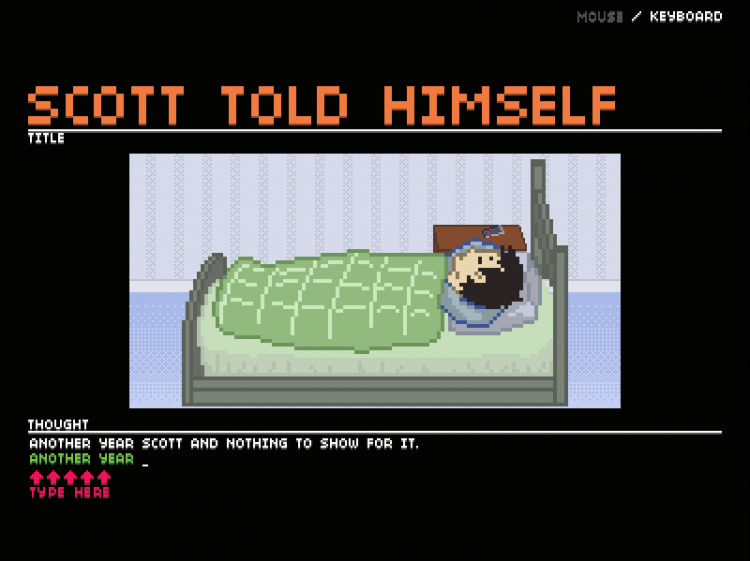 The four scenes we had planned for Scott Told Himself were all necessary for the story of the game, but required far more dialogue, actions, and generalized scripting that anticipated. Even simple actions like moving a character across the screen needed to be implemented on an individual basis. In hindsight the idea of creating an entire game around scripted moments was a bit ambitious for the purposes of this project. Prototyping lends itself to systems and mechanics, not content. Content takes time, effort, and energy that is probably better served on things that give greater bang for the buck. Not even finishing Scott Told Himself could completely save it from a lot of other small issues. The scope of the game in the end was too large for what we were doing within the constraints of our project and the design was a little too niche for most people. However we are happy that we managed to complete the game and try something a little different with a typing game. This entry was posted in Postmortems, Project 2: Scott Told Himself. Bookmark the permalink.